Ticket Templates for Church and Fund Raising Events – Most events need a ticket and each need to fit with that event. Here are a few Amazing Ticket Templates for Church and Fund Raising Events by 4cgraphic that are sure to fit your occasion. Church banquets, art shows, anniversary celebration events, concert and more. These Ticket Templates are unique in their design and most are ready for perforation and numbering. Harvest Gala Ticket Template is geared for church harvest celebration events. Great for banquets, Galas, Cantatas, Concerts, Sermons, or any event that needs an elegant ticket. The purple and gold colors combined with soft patterns makes this ticket elegant. 4 Alternate color options are included. Anniversary Banquet Ticket and Jacket Template is for anniversary celebrations, banquets and appreciation events for churches and and non-profit organizations. Can be edited for other events throughout the year. Gold and khaki colors are used, for this elegant design – perfect for all commemorative occasions. Independence Gala Ticket Template is for Independence celebrations, anniversary celebration, banquets and appreciation events for churches and and non-profit organizations. Can be edited for other events throughout the year. Gold and khaki colors are used, for this elegant design – perfect for all commemorative occasions. Church Anniversary Banquet Ticket Template is for anniversary celebration, banquets and appreciation events for churches and pastors. Can be edited for use for other events throughout the year. The gold and purple colors used, gives it a royal kingly theme that is attractive and elegant – perfect for all commemorative occasions. Clergy Anniversary Banquet Ticket Template is for anniversary celebration banquets and appreciation events for church pastors. Can be edited for use for other events throughout the year. The gold and purple colors used, gives it a royal kingly theme that is attractive and elegant – perfect for all commemorative occasions. Worship Concert Ticket Template is for any kind of church concert event. Great for church worship concerts, plays, album releases and more. The modern design with light friendly colors will appeal to a wide demographic. With this 9 Days of Kingdom Music Event Ticket Template you’ll have the highest quality presentation. The composition is geared towards churches anyone who needs majestic mood to match their event. You’ll find this file easy to use. It’s great for Church events, Conferences, Gospel concerts, and lots more. With this Warfare Gaming Event Ticket Template you’ll have the highest quality presentation. The composition is geared towards anyone who needs a war mood to match their event. You’ll find this file easy to use. It’s great for DJs, Conferences, concerts, private parties, Expos, gaming and lots more. With this Rhymer Urban Event Ticket Template you’ll have the highest quality presentation. The composition is geared towards anyone who needs a mysterious, dark, war mood to match their event. You’ll find this file easy to use. It’s great for DJs, Conferences, concerts, private parties, gaming and lots more. Tropical Picnic Ticket Template is for any kind of community event. The tropical colors and design lends itself to activities like picnics, bar-be-ques, beach parties and more. Pastor Appreciation Church Flyer and Ticket Template is sold exclusively on graphicriver, it can be used for any kind of anniversary events, especially for Pastor’s Appreciation Month. It’s default color is black and gold, but the color is fully customizable. Great for Banquets, Anniversary Balls, Commemorations, Independence Celebrations, Church Anniversaries, Thanksgiving and Christmas events etc. Pastor’s Appreciation Gala Church Flyer and Ticket Template is sold exclusively on graphicriver, it is geared towards usage for any kind of anniversary events, especially for Pastor’s Appreciation Month. It’s default color is red with gold decor and text, but other color choices are available and it is fully customizable. Great for Banquets, Anniversary Balls, Commemorations, Independence Celebrations, Church Anniversaries, Thanksgiving and Christmas events etc. Origins Flyer, Ticket and CD Template is geared towards any Church event that deals with topics such as Eden, Life, Creation, Genesis, Nature, Animals, and Stewardship to the Earth. Night at the Movies Church Flyer and Ticket Template is sold exclusively on GraphicRiver, it can be used for your Movie Events, Conferences, Youth Programs, Sermon Series etc. Gospel Fest Concert Ticket Template is for church concerts or any other event that requires a modern ticket with perforation and numbering. 4 one-click color options are included. Diamond Jubilee Event Ticket Template is for any kind of event. The floral design lends itself to other activiities like birthdays, luncheons, baby showers and more. Folded Anniversary Ticket Template is geared towards usage for any kind of anniversary events. Anniversay Ball, Commemorations, Independence Celebrations, Church Anniversaries etc. Make it part of your arsenal in your template database. The Layout has a front and middle. This template is made to be scored and folded. Mozart to Beethoven Event Ticket Template is geared towards usage for any kind of performance art event. Use it for Valentines Shows, Classical Concerts, Charity Events etc. The contemporary design lends itself to almost any modern occasion. Art Expo Ticket and Event Pass Template is geared towards usage for any Art Event. It is designed with a modern, painterly, eye catching marketing style. You can add your own artwork that represent the event. 8 one-click colors events are included. Vintage Banquet Ticket Template is for any kind of fundraising or commemorative banquet event. The vintage design lends itself to almost any other occasion eg. charitable fundraisers, parties, lunchions, park events cooking competitions and more. Vintage Bar-B-Que Ticket Template Set is for any kind of fundraising or food events. The vintage design lends itself to almost any occasion eg. charitable fundraisers, parties, octoberfest, park events cooking competitions and more. Fish Fry Ticket Template is for any kind of fundraising or food events. The vintage design lends itself to almost any occasion. Great for charitable fundraisers, parties, bar-b-ques, park events and more. Folded Banquet Ticket template is geared towards usage for any kind of anniversary events. It’s default color is red with gold decor and text, but other color choices are available and it is fully customizable. Great for Banquets, Anniversary Balls, Commemorations, Independence Celebrations, Church Anniversaries etc. Make it part of your arsenal in your template database. The Layout has a front and middle. This template is made to be scored and folded. BarBeQue Raffle Ticket Template can be used for fundraising ventures or events. Designed with a western retro style that can fit most fun occasions. 4 one-click color options are included. In this package you’ll find 1 Photoshop file. 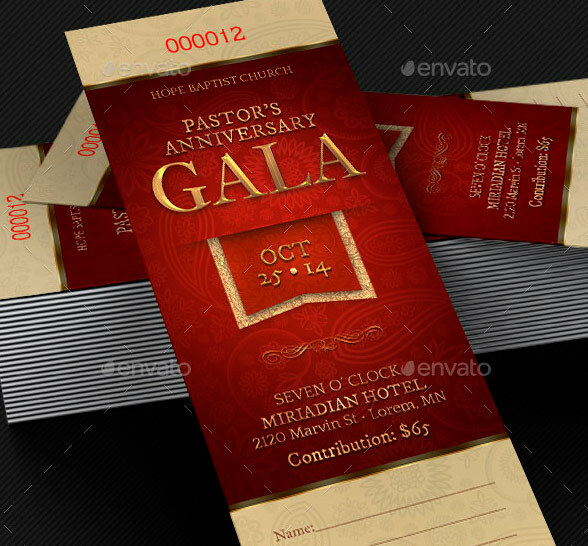 Gala In Gold Anniversary Ticket is sold exclusively on GraphicRiver and is geared towards usage for any kind of Anniversary or Church Event. Use it for Commemorative Events, Anniversay Ball, Commemorations, Independence Celebrations, Church Anniversaries, etc. The classical design lends itself to almost any occasion. The available One Color and Fullcolor options give you flexibily. There are 8 Fullcolor options and you can use any spot color and paper combination with the One Color version to create a unique ticket for your occasion. Ticket is setup for perforationa and numbering. Make it part of your arsenal in your template database. Harvest Fest Photoshop Flyer Template is great for any Church Fall or Harvest Festival, but can be used for just about any autumn season event. Layered Photoshop file is color coded and organized in folders for easy editing. It’s Musical Event Flyer, Ticket and CD Template is geared towards usage for any kind of church musical or drama events. Use it for Musical Concerts, Choir Concert, Solo Artist Concert, Gospel Fundraising Concerts and more. The classical victorian design with floral and ornamental touches lends itself to almost any occasion. Make it part of your arsenal in your template database. Tea Party Mini Ticket Template is designed with a mix between modern and vintage styles. Geared for a formal or semi formal events like tea parties, office parties, convention parties, banquets, anniversary celebrations, after parties and more. This file has 8 color options for quick color changes to match your design scheme. Vintage Dinner Concert Ticket and Bookmarker Template is geared towards usage for any kind of church fundraising or commemorative events. Anniversay Ball, Commemorations, Independence Celebrations, Church Anniversaries etc. The classical vintage design with aged grunge and floral decals lends itself to almost any occasion. Make it part of your arsenal in your template database. Simply Golden Ticket and Event Pass Template is geared towards usage for any Entertainment Event. It is designed with a classical gold on black style with 4 one-click color options. Sold exclusively on graphicriver.net. Charitable Sports Events Ticket Templates are for sports club, charity organization, school fundraisers and competition tournaments. The retro grunge style will give your event a nostalgic appeal. Spiritual Christmas Concert Ticket Template is customized for events during the Christmas Season. The modern festival of lights theme can be used for other types of events with simple changes. You can change colors easily by editing the included color options. Victorian Style Fifty Fifty Ticket Template is great for any victorian or country theme event, Use it for fundraising. In this package you’ll find 1 Photoshop file. Western Style 50/50 Raffle Ticket Template is great for any western or country theme event, Use it for Fundraising. In this package you’ll find 1 Photoshop file. 4 One-Click color options are included. Dinner and Dance Event Ticket Template is customized for Dinner and Dance, Banquets, Galas and other fund-raising events. Can be edited for use for other events throughout the year. You can change colors easily by editing the included color options. Barn Dance & BBQ Raffle Ticket Template is great for any western or country theme event, Use it for Hoedown,BBQ, or Rodeo Shows. In this package you’ll find 1 Photoshop file. 4 One-Click color options are included. All layers are arranged, color coded and simple to edit. Christmas Raffle Ticket Template is geared towards Christmas and Holiday events. Can be used for gift give aways, banquets, office parties and more. Corks and Kegs Ticket Template is geared towards beer tasting and wine tasting events. Can be used for networking events, club events, banquets, office parties and more. With this Game Expo Ticket Template you’ll have the highest quality presentation. You’ll find this file easy to use. It’s great for DJs, Conferences, parties, gaming and lots more. This 80’s Dinner Party Flyer and Ticket Template is customized for any Christian Events that need a vintage, yet modern & unique look. Dub Nation/Gospel Nation Flyers and Event Tickets template bundle is customized for the Dubstep/ and Gospel Music Entertainment scene, but can be customized for any event. Gospel Expressions Church Flyer, Ticket and CD Template has a retro style for a contemporary upbeat church event. Use it for concerts, fundraisers, youth retreats, or just about any event that needs a modern, eye catching church marketing package. Gospel Fire Church Flyer, Ticket and CD Template uses a very cool fire text effect to symbolize the Holy Spirit of God amongst His people. Use it for concerts, youth retreats, album releases or just about any event that needs a modern and hot, eye catching church marketing package. Rose of Sharon Sermon Church Flyer and CD Template is geared towards usage in any Contemporary Church Event. The template is perfect for events dealing with love, Jesus, Marriage, Covenant, etc. Painting Classes Flyer, DVD and Ticket Template is for art classes and art events or any other event that needs a modern painterly design. Christmas and Valentines Ticket Templates Bundle are for church events during the Christmas and Valentines Holidays. It can be easily customized for other events. Harvest Festival Concert Ticket Template is great for any Church Fall or Harvest Festival, but can be used for just about any autumn season event. Gospel Concert Ticket Template is geared towards usage for any Contemporary Church Event. Use it for concerts, conventions, youth retreats, album release events or just about any concert event, just change the photo to match. Gospel Fire Ticket Template uses a very cool fire text effect to symbolize the Holy Spirit of God with His people. Use it for concerts, youth retreats, album releases. 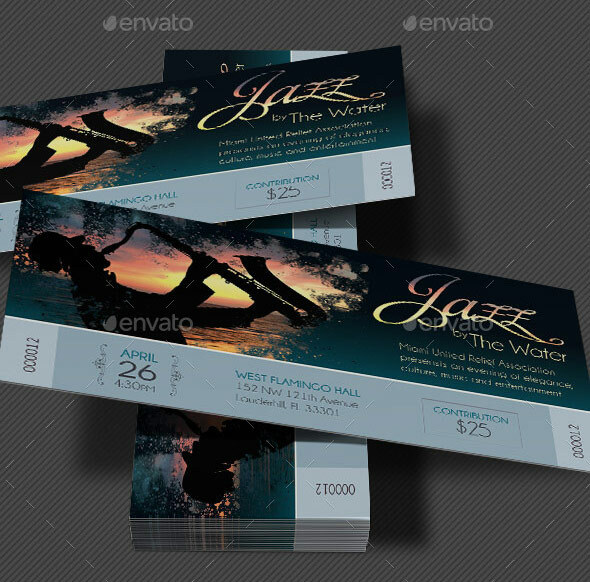 Musical Concert Ticket Template is geared towards usage for any kind of church musical or drama events. Use it for Musical Concerts, Choir Concert, Solo Artist Concert, Gospel Fund-raising Concerts and more. Christmas Pageant Ticket Template for church events during the Christmas Holidays. It can be easily customized for other events. Use it for Christmas cantatas, concerts, dramas, office parties, fund-raising parties and more. Valentines Pageant Ticket Template for church events during the Christmas Holidays. It can be easily customized for other events. Use it for Christmas cantatas, concerts, dramas, office parties, fund-raising parties and more. Anniversary Banquet Ticket Template has a vintage design that will give a classical theme to your event. It is geared towards usage for any Contemporary Church Anniversary Event. Holiday Banquet Ticket Template has a vintage design that will give a classical theme to your event. It is geared towards usage for any holiday event. Use it for Holiday and Christmas Galas or church cantata, banquets, tea parties etc.